The Acer Aspire Cloudbook One comes in 11-inch and 14-inch versions. This is the 14-inch version. Acer has come out with new Windows 10 laptops, and they'll arrive with low prices to compete against Google's Chromebooks. The Aspire One Cloudbook series was announced on Tuesday, and it comes in two screen sizes, 11-inch and 14-inch. The smaller laptop will start at US$169, while the latter will be priced at $199. That puts them in the same price range as Chromebooks, which have been competing against Windows PCs. Although Microsoft's operating system still dominates the PC market, Google's Chrome OS has been seeing rising adoption. 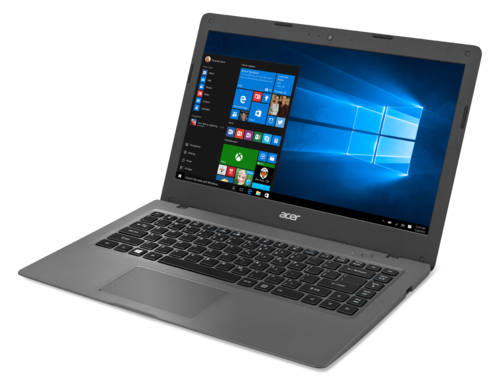 Like the Chromebooks, Acer's new Windows 10 laptops will also leverage cloud-based software, but from Microsoft. Both laptops come with a one-year subscription to Office 365 Personal, and at least 100 GB of online storage through Microsoft OneDrive. Over the last year, Acer has been developing its own cloud-based apps, which will also be installed on the two laptops. Acer's software lets users store their multimedia files online, and sync that data between PC, smartphones and tablets. The Aspire One Cloudbooks, however, feature little onboard storage. The 11-inch version can be bought in 16 GB or 32 GB configurations, while the 14-inch version has 32 GB or 64 GB of storage. The laptops have 1366 by 768 pixel screens, 2GB of RAM, and use Intel's newest Celeron mobile processors. The 11-inch model weighs 1.15 kg, while the 14-inch weighs 1.6 kg. In addition, the two products have HDMI, USB 3.0, USB 2.0 and SD Card ports. Acer has also fitted dual microphones on the laptops, for better access to Microsoft's Cortana personal assistant. The 11-inch model will arrive in North America in August, and then in Europe in September. The 14-inch version will come a month later in both regions.